Vance feels tough to pin down. Is it classic? Country? Cool? Or maybe all of the above. 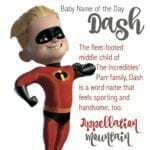 Thanks to Rhiannon for requesting our Baby Name of the Day. It’s easy to make the case that this name counts as a classic. It’s appeared in the US Top 1000 every single year, save for 1882, 1998, and 2000. As of 2017, Vance ranked a rare, but respectable, #838. That puts this name in good company, steadily used over the decades, and tough to peg to a single era. It comes from the Old English word fenn. We still use the word fen today to refer to a type of wetland, sometimes called a marsh or bog. That puts this name in the subtle nature-inspired choices category, akin to Reed or maybe even Kai. But something about this name strikes me as cowboy cool. Maybe it’s because Vance peaked in the 1960s, briefly reaching the 300s. 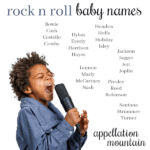 That tracks with the rise of plenty of Western-inspired boy names, names like Bart and Clay. There’s also a mournful song by country singer Roger Miller. You almost certainly know Miller’s upbeat ode to vagabond life, “King of the Road.” In 1968, Miller recorded a mournful song titled “Vance.” It has a happy ending, though, so even if it wasn’t Miller’s biggest hit – or even much more than a blip – it’s easy to imagine fans embracing the name for their son. The name kept its country vibe, and added a layer in the early 1980s. Since its debut in 1979, The Dukes of Hazzard had become a smash hit. By 1982, stars Tom Woppat – Luke – and John Schneider – Bo – were entangled in contract disputes. The stars walked, and the show’s creators handed the keys to the General Lee over to two hastily-cast cousins, Coy and Vance. There’s a tiny uptick in the name’s use around that time, but only a small one. The cousins proved unpopular, and Bo and Luke soon returned. Still, it helps cement the name’s image as slightly Southern. 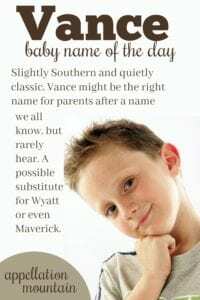 And it’s worth noting that while The Dukes of Hazzard feels painfully dated in many ways in 2018, we’re all borrowing our baby names from their characters. If you’ve heard this name previously, it might have been as a surname. On The Office, Phyllis marries a refrigeration company owner who always introduces himself as “Bob Vance, Vance Refrigeration.” For the current generation of parents, that’s doubtless a more familiar reference than the 1980s one. In 2000, Will Smith played mysterious golf caddy Bagger in The Legend of Bagger Vance. While the title is memorable, and the cast noteworthy, the movie bombed. Vivian Vance played Ethel Mertz, the long-time sidekick for Lucille Ball. Add in athletes, authors, politicians, and you’ve probably heard the surname used at least a handful of times. If you’re a comic book fan, you might also think of Major Victory, born Vance Astrovik. Astrovik debuted in 1969, one of the founding members of the The Guardians of the Galaxy. He wore other aliases and formed other alliances over the years. And while he’s an obscure character today, there’s always the possibility that nearly any Marvel creation might be just one big-screen blockbuster away from becoming a household name. Though for what it’s worth, there’s never been a whisper about including the character in the Guardians films, and fan site suggest that his story doesn’t mesh well with the current timelines. Still, the first Iron Man movie only came out ten years ago – who among us could have predicted how vast the Marvel on-screen Universe would become back in 2008? Where does all of this leave the name? On the plus side, it’s a V name, which gives it stylish points. 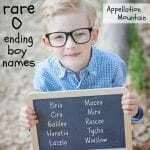 And it almost fits with boy names ending in the ‘s’ sound, too, like Miles and Brooks. And it’s never really taken off – as I mentioned earlier, the name doesn’t belong to a specific decade. At the same time, it’s a name we’ve all heard before. The name remains just under the radar, an unusual choice with plenty of history and a sound that could fill nicely on-trend today. What do you think of Vance? Intreresting! I’ve never met a Vance. Can I make a request for a post about the name Dido?